Make sure your machine meets with the requisites presented at Bizagi Studio system requirements. Take into account that you will need to have a 64-bit operating system installed. 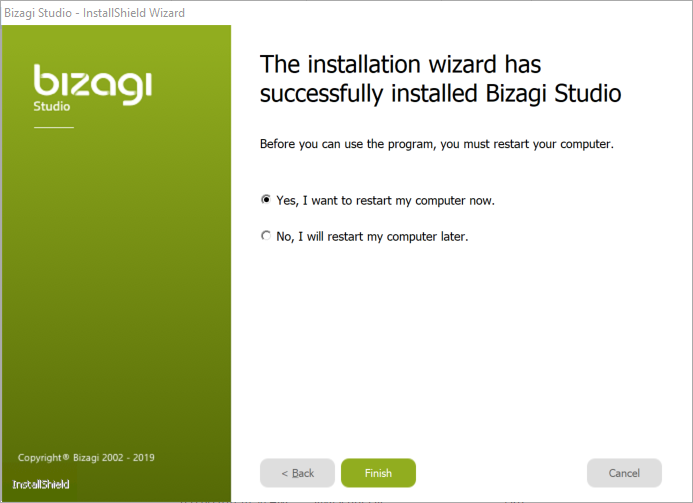 At this point you should already have the Bizagi Studio official installer at hand (as described at Downloading Bizagi Studio). 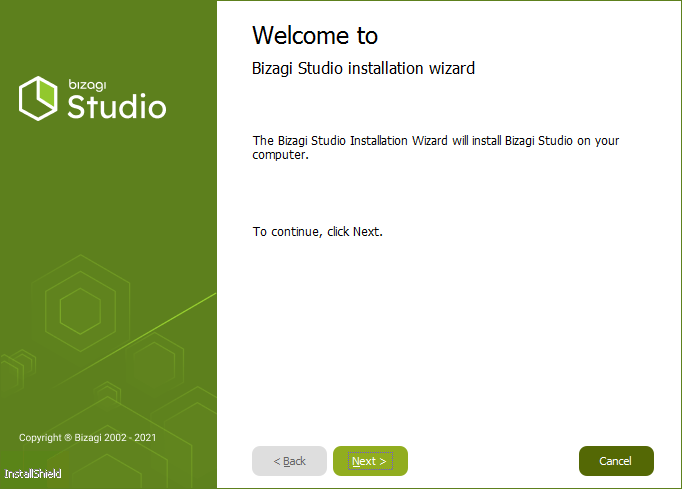 To install Bizagi Studio, follow the steps presented above. If you are going to install Bizagi with the default database, SQL Server Express 2017, keep in mind that you cannot install SQL Server Express 2017 when C++ Redistributable 2017 is installed. Please uninstall it before installing SQL Server Express 2017. You can reinstall it after. Whenever the installer detects that a reboot is pending on your machine, or its 4.5 .NET framework prerequisite is missing, it will prompt you for a reboot before continuing. After a reboot, the installer will automatically resume the installation process where it left. 3. Click next on the Welcome window of the installation. 4. Review the terms of Bizagi Studio license agreement, accept them and click Next. The installation will detect if SQL Server is already installed. 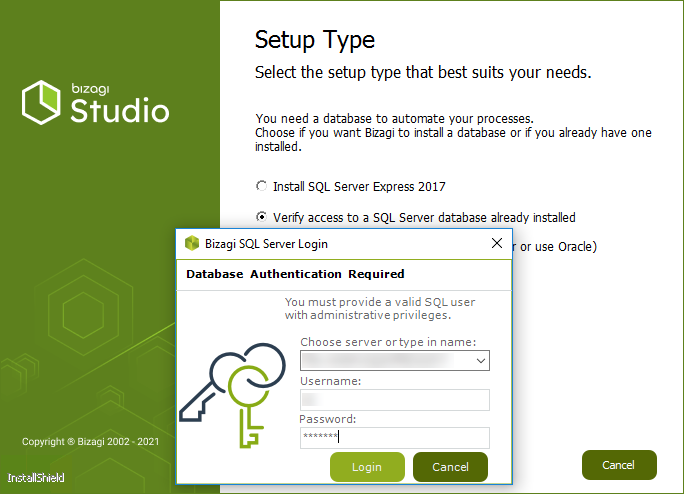 If you don't have an installed SQL Server database, select the option to include a local installation of SQL Server Express 2017 (by choosing "Install SQL Server Express 2017"). SQL Server Express 2017 is not compatible with Windows 7 and Windows Server 2008. 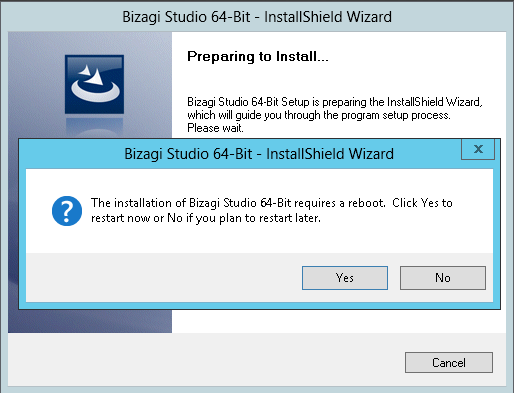 Nonetheless, you can still install Bizagi Studio and install independently a compatible SQL Server version. If you do not have a compatible database installed, select "Skip this step (I will install the database later or use Oracle)" to continue with the installation. If you do have an installed a compatible SQL Server database, you may choose to select "Verify access to a SQL Server database already installed". On the other hand, and if you do have an installed SQL Server database, you may choose to select "Verify access to a SQL Server database already installed". With the latter option, it is necessary to make sure you provide the Username login and password (SQL Server authentication) for its connection in the next window. After entering the information click Login to verify the connection. You may also choose to skip this step in the installation itself (for instance, if you will use an Oracle database). Though, you will require proper database configuration later on in order to create a project in Bizagi. Otherwise, and to select a different folder location, click Browse, and choose the file directory of your choice. In the following window review if you do not wish for Bizagi to check and notify you when a new version is available. To have Bizagi show you an update notification, make sure that the Check for updates checkbox is marked and click Next. Bizagi will install its required components such as Microsoft's .NET Framework version 4.6.1 (which in turn, other components such as Visual C++ 2010, 2008 Redistributable) if not already installed. The following window will appear when the installation is complete. Note that this installation requires a reboot for proper operation. 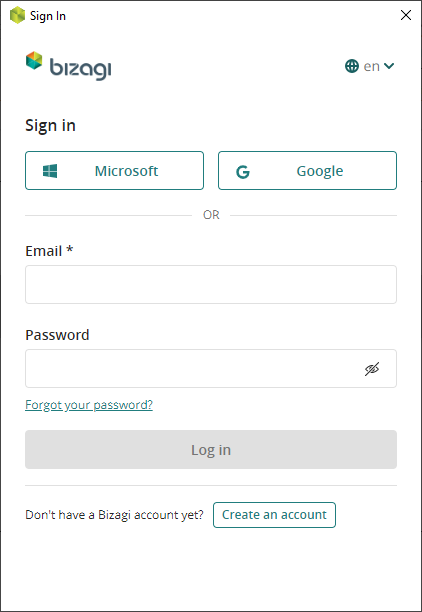 When launching Bizagi Studio, note that you may be presented with a prompt to input your www.bizagi.com account credentials, so that you can benefit from all free online resources and support provided by Bizagi. At this point, you should make sure you have created a Bizagi account as instructed at Register to join the community. 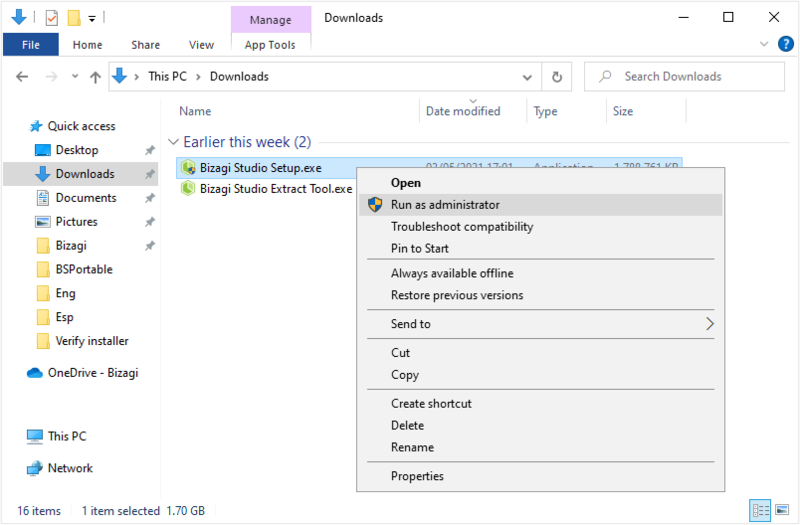 Once the installation procedure is completed, you may use the Launch Bizagi Studio option, or easily locate the desktop shortcut to run Bizagi Studio. You may create a new Bizagi project to get started with Bizagi, as described at Bizagi projects.